Great location, very comfortable beds! Staff were friendly. The layout was very utilitarian but light and airy and totally suited the environment. 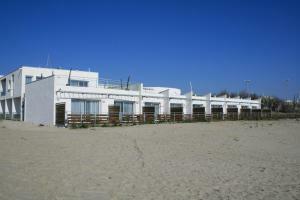 Nice clean apartment with perfect position straight onto the beech. Easy 5 min walk into the centre. Small heated pool that was great for a warm up dip after swimming in the sea. Fantastic location - one can say it is not even by the beach - it is pretty much on the beach but also just a short walking distance to the town centre, supermarkets, bakery. The apartment for 4 people has everything needed for a holiday stay - fairly well equipped kitchen, terrace to enjoy the sea view. Reserved parking available for a free. The rooms were cleaned once by the staff and all cleaning tools provided for self-maintenance of the apartment. The hotel staff were helpful and solved enquiries fairly promptly. The place was very nice. Basically on the beach, and, the beach was wonderful. The pool was very nice as well. The residence was actually on the edge of the beach - perfect! 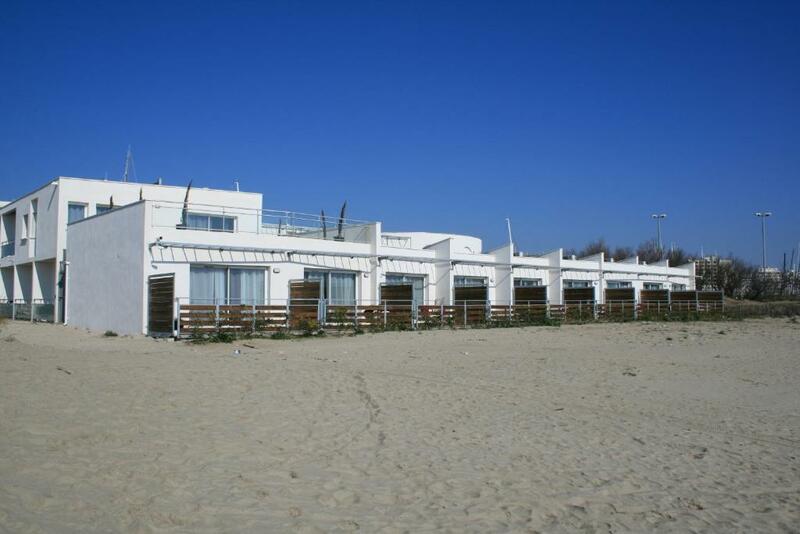 Location is just excellent: right on the beach, next to marina, far away from crowded beaches in front of big hotels. The wide and clean sandy beach is just perfect for children - clean and warm shallow water, not too deep, so kids could play there for hours. Several grocery stores are in a walking distance, private parking available on site. Less than an hour drive to Montpellier, Nimes; oysters farms, vineyards and plenty of other places to visit. Well-equipped kitchen (dishes, utensils, pots, frying pan). New induction cooker, fridge and dishwasher. The room small but cosy. Great localization directly on a sandy beach. Hope to come back there. Location was just excellent literally right on the beach the lounge was quite spacious and the heating and air-conditioning works really well property was light and airy just what you need for short break holiday. Lock in a great price for Résidence Coté Mer – rated 8.3 by recent guests! 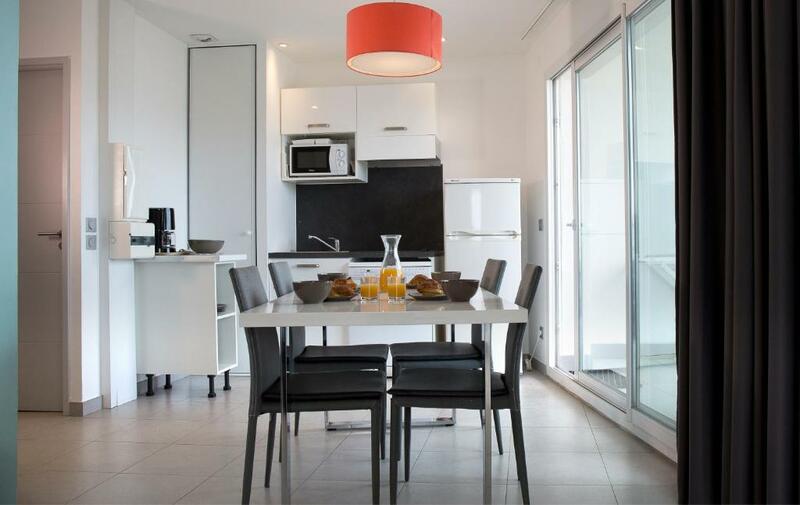 One of our top picks in La Grande Motte.Located on Couchant beach in La Grande-Motte, this residence provides modern accommodations with free Wi-Fi. Guests can swim in the outdoor swimming pool or in the Mediterranean Sea. A children’s pool is also available and the Arena entertainment hall is a 15-minute drive away. Résidence Coté Mer has self-catering apartments and studios, all equipped with air conditioning, a flat-screen TV with satellite channels and a balcony with a view of the sea or the harbor. The private bathroom includes a bathtub or a shower for the apartments and a hairdryer. All of the accommodations at Résidence Coté Mer also feature a kitchenette, with electric hotplates, a microwave and a refrigerator. There are also a dishwasher and a coffee machine. Free public parking is available on site and Montpellier is 12 mi from the property. Private parking is also possible with an extra cost and Aigues-Mortes is 6.2 mi away. When would you like to stay at Résidence Coté Mer? 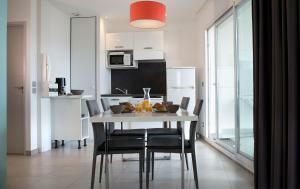 -	An equipped kitchenette with a dishwasher. Bed linen, towels and final cleaning are included in the rate. -	An cabin with 2 bunk beds. -	An equipped kitchen with a dishwasher. -	A cabin with 2 bunk beds. 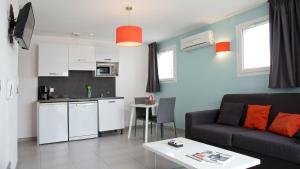 This studio is suitable for guests with reduced mobility. This apartment is suitable for guests with reduced mobility. 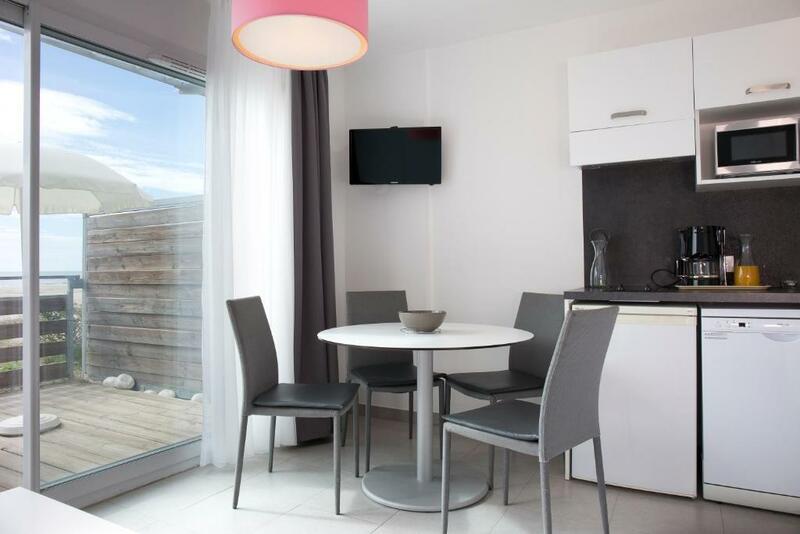 The 3-stars Côté Mer residence, ideally located, on the seafront of the Mediterranean Sea, 15 minutes away from the Montpellier Exhibition Center and Arena, offers you a peaceful atmosphere and modern fully furnished self-catering vacation rentals. Seafront or overlooking the marina, superb vacation accommodation for couples, families or corporate travelers! 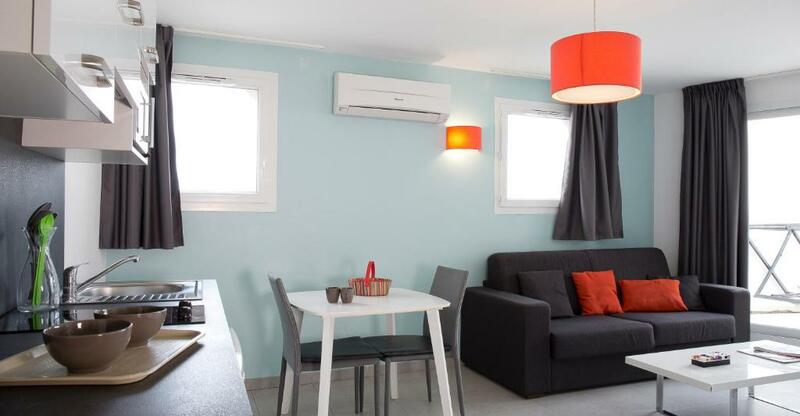 The contemporary little holiday residence, one-level building, with at most 27 apartments for 2 to 6 people, renovated and refurbished, is open all year round and features a heated swimming pool. House Rules Résidence Coté Mer takes special requests – add in the next step! Résidence Coté Mer accepts these cards and reserves the right to temporarily hold an amount prior to arrival. Reception is closed on Wednesday and Sunday during the low season. Please contact the property regarding arrivals on these days. Please inform the property in advance of your expected arrival time and of the number of guests per accommodations. Reception opening times: 09:30 to 12:30 and 15:00 to 19:00. Please note that for stays of 1 to 6 nights, there is a EUR 5 per night charge for use of a children's cot. Please note that there is a EUR 21 charge for use of a children's cot for a one week stay. Please note that for stays of 1 to 6 nights, there is a EUR 15 per night charge for use of an extra bed. Please note that there is a EUR 9 charge for use of an extra bed for a one week stay. Please note that for stays of 1 to 6 nights, there is a EUR 5 per night charge for use of a children's high chair. Please note that there is a EUR 21 charge for use of a high chair for a one week stay. Extra beds, baby cots and high chairs are available upon request and subject to availability. A child's cot can be provided according to the type of accommodations. Please contact the property for more details. Children under 3 years of age stay for free if the guest brings their own children's cot. Please note that there is heated outdoor pool available depending on season and weather conditions. A 30% deposit will be charged by the property anytime after booking. Please inform Résidence Coté Mer of your expected arrival time in advance. You can use the Special Requests box when booking, or contact the property directly using the contact details in your confirmation. There was a weird beeping noise in the downstairs bedroom, we could only really sleep by turning on the air conditioner to drown out the noise. There are also requirements to have the place fairly clean before leaving, which is fine, but there are no cleaning supplies provided, we had to buy an entire box of dishwasher tablets and only had to use 2. Same goes for dish sponges, soap, toilet paper etc. Maybe it's a cultural thing, but if you're not used to it, then it's a bit inconvenient. Walk in shower instead of bath. All OK no major negatives. The kitchen area, while well equipped, is small, forming one room with the living room that also transforms into a bedroom. Wi-fi connection is poor in places and worked intermittently. Apart from an umbrella, there is really no roofing form the sun in the terrace, which can make it pretty unbearable to stay outside. While the website of the hotel correctly described the rooms, the booking.com website did not point out that some of the apartments had two levels. We were traveling with a handicapped child and it was unfortunate that the toilet was downstairs and the sink was upstairs. Facilities are still good enough, but could be renovated. The small minus for not providing cleaning supplies, such as dishwashing liquid or kitchen sponge, except for only one dishwasher tablet. No toilet brush! Only one roll of toilet paper, not refilled during your stay. If you want more, you need to buy it. The room was a bit cold, with thin blankets and tiled floors. The property had a hard summer by the look of the decor and in need a little maintenance here and there, for example there are tiles coming off the skirting area in the bathroom and the kitchen and the paint work needed touching up in places and in the kitchen the worktop had been badly damaged by someone putting a hot pan on it do needs-replacing, the cutlery and plates could’ve really been cleaner and the overblankets provided for the Beds were full of what seemed to be dog hairs. Very uncomfortable sofa-bed. Noise from the marina and street works all days from 8am till 5pm. Near to the beach and nice bars.. Very helpful staff.